Express way for end users. Select tables to be exported. Choose needed fields to be exported. Filter needed records to be exported. Select Excel Sheet to be imported. Preview data before apply to table data. Support Delimited format such as csv, semicolon, tab ... or user-defined. Support Number and Date Time format. 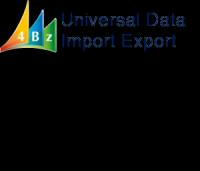 User can select Import Destination as Package Data (for preview) or Database. Analyze Delimited or Fixed Width header text and set Fields accordingly. User can copy Configuration Packages Definition via XML file between systems. Skip updating existing Database Records. Export data by Specified Filter, e.g. Customers and their Sales Line Discount. Import/Export Table Data for Duplication.